How can I configure a GSM Modem in Ozeki NG SMS Gateway? To setup a GSM modem, first you have to attach it to your PC. The next step is to find out which serial port (COM Port) is your GSM modem attached to. After you have this information install the GSM modem service provider connection. I am a hardware vendor. Can I add my modems to the list? Ozeki is a leading supplier of corporate SMS solutions. Listing your devices on this page can bring you customers. If you think your device is suitable for SMS messaging, and you want to add it to the list let us know! This webpage lists the GSM modems you can use with our SMS software products. The officially recommended models can be purchased directly from Ozeki. They are good options if you wish to build a reliable SMS solution. If you have never attached a GSM modem to a server computer it is recommended to read the "How to attach a Wavecom modem for SMS messaging to your server computer" guide. If you already have a GSM modem and you wish to find out how you can send and receive SMS messages with it, read the "How to create the software configuration for a GSM modem for SMS messaging" guide. We install these models at locations where our engineers deploy the system. They are very reliable and are excellent choices for SMS messaging. This programmable gateway offers quad-band GPRS connectivity in a ruggedized, plug-and-play form factor. It features an open-standard expansion card interface, enabling you to add additional IO connectivity or features like GPS, WiFi, Bluetooth, Zigbee and more. A Quad-band 850/900/1800/1900 Mhz, reliable GSM/GPRS modem. features an open-standard expansion card interface, enabling you to add additional IO connectivity or features like GPS, WiFi, Bluetooth, Zigbee and more. This is a HSDPA USB Modem. It can be purchased as a modem for Internet connectivity at almost every GSM service provider. It can be used for SMS messaging. Hint: To configure it, you must close the Internet connectivity application, that comes with the modem (e.g: Vodafone Internet Connection Manager). These models were reported by our customers as reliable devices, to be used with Ozeki NG SMS Gateway. Some of them were tested by our engineers as well. A reliable dualband GSM 900/1800 Mhz model. Excellent option for SMS and MMS transfers. A reliable dualband GSM 900/1800 Mhz GSM Modem. The Nokia 30 and the Nokia 32 GSM modems can be used to send and receive SMS messages, but are not the best options. Based on our tests they are not as reliable as other models. The MultiModem? GPRS wireless modem offers standards-based GSM/GPRS Class 10 performance. 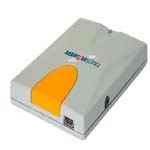 iTegno 3898 PCMCIA GPRS Modem- your perfect wireless access solution. iTegno 3000 is an ideal companion for mobile professionals with its light weight, portable size, embedded antenna and low power consumption. iTegno 3232E and 3232I are Class 10 RS-232 modems widely adopted by corporate and industrial users. TANGO55/56 - Tri Band GSM/GPRS terminal for industrial applications. The SA-EL is a GSM/GPRS and EDGE standalone modem with a USB interface and 5 Vdc input (powered via USB). The SA-G is a GSM/GPRS standalone modem with an RS-232 interface, 5-30 Vdc input and programmable I/O. The SA-GL is a GSM/GPRS standalone modem with an RS-232 interface and 5 Vdc input. Sierra USB 306 is a standalone wireless modem with a USB interface and ensures top speeds up to 21 Mbps download and up to 5.76 Mbps upload for both Microsoft Windows and Mac OS X users. It is available in USA. Novatel Wireless U998 is standalone wireless modem with speed up to 21 Mbps with a USB interface. It is available in USA. There is a good chance, that if you purchase any mobile handset that comes with a data cable, it can also be used for SMS messaging. Most GSM handsets contain a built in modem that provides this functionality.